Getting the most out of life doesn’t have to be some abstract notion. Sure, we all want to better ourselves and accomplish goals in our lives, but making it happen often becomes the challenge. Scientific proof points towards a correlation between goal-setting and rate of success. Like the popular book The Secret shared with the world several years ago, sometimes just declaring to the universe what you want can help make it happen. A similar notion is utilized with The Lifeboard. It’s really simple. 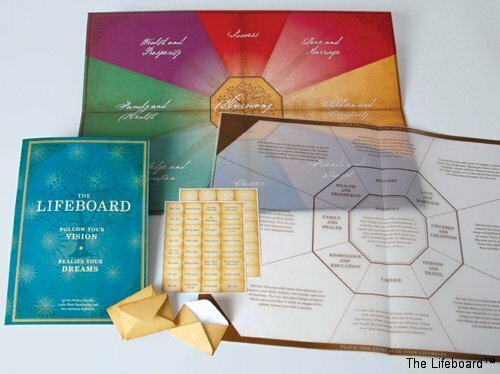 There is a physical board (resembling a board game) that’s divvied up into principle sections that correspond with major aspects of life including Career, Family & Health, Love & Marriage, Knowledge & Education and more. The user can tape any inspiring image, taken from magazines, photographs, motivational stickers (provided), etc. in each section. This time your goals are literally in front of you, staring you in the face. The set also includes an 80-page book and guided journal. Last month, a small group of SpaFinder staff members were lucky enough to partake in a private workshop in our offices led by the creators Sue Shifrin-Cassidy, Linda Blum Huntington, and Eva Adrienne Anderson. Afterward, The Lifeboard gals taped a presentation for Wellness Week™ to help celebrate our movement toward inspiring healthier, happier lives. It’s a perfect fit as Lifeboarding helps to heal, de-stress, achieve goals, and simply get the most out of life. Here the trio explains it best: How The Lifeboard works, why it is instrumental in self-discovery, and what a fleshed-out Lifeboard looks like. NEW! Stay tuned for details on an upcoming workshop by The Lifeboard creators, brought to you by SpaFinder’s SpaRahRah, to be held during the spring in Los Angeles. The Lifeboard retails for $22.95.